The Angels Branch of the Sierra Railroad is one of the most famous and unique shortline branches in the world. The Angels Branch of the Sierra Railroad in California's Mother Lode, built between Jamestown, CA and Angels Camp, CA began operation in 1902. It travelled deep into the Stanislaus River canyon, traversing several switchbacks on the steep grades down to the Stanislaus river and back up. The branchline took a big hit during the great depression and finally was abandoned in 1937. In 1976 I was fortunate enough to be able to hike the entire length of this Sierra foothill's railroad branchline before it was flooded below hundreds of feet of water for a new reservoir - The New Melones - a part of California's Central Valley Water Project. During the 2 day hike, I could clearly see the cuts and switchbacks, yards, small towns and mine sites. In the future, I'll upload some photos from this trek. Below I've included some links to resources of interest about the history of the Sierra Railroad and the Angels Branch - both of the prototype and models in various scales including HO, O and S scale. 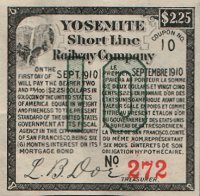 Also, please check out my related website dedicated to the Hetch Hetchy Valley Railroad and Yosemite Valley Shortline - both neighbors of the Sierra, sharing a common history in part. Return soon as I'll be adding new material here on a near daily basis. Sierra Railway #30 - Gus's Special - The little 2-6-2 was originally built for the Sierra Railway as their Number 30. She is slightly smaller than the standard logging 2-6-2 of that era. In all, the locomotive weighs about forty-nine tons, and has forty-two inch drivers, as compared to the more common forty-four inch drivers that are found on logging locomotives. The Number 30 was built for the Sierra's branch that existed between Jamestown and Angels Camp. The branch had heavy grades, tight curves, and four switchbacks, which required a very flexible, yet gutsy locomotive. The branch had been built in 1902, and prior to the arrival of the Number 30, geared power had handled most of the traffic. In addition to their 2T Shays, and 2T Heisler, Sierra's 3T Shay, Number 12, which is also now owned by the Association, probably worked the branch. With the arrival of the Number 30, Sierra disposed of the last of their geared power. 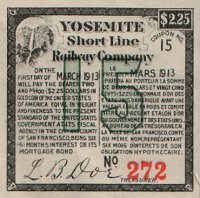 The Sierra Railway of California was incorporated January 1, 1897. Behind the incorporation was Mr. Thomas S. Bullock, a New York railroader and former owner of the defunct Prescott & Arizona Central Railroad, as well as chief promoter of the new line. Providing financial resources were Mr. William Crocker, San Francisco banker and treasurer of the California Exploration Company (which owned many mines in the Mother Lode) and his brother-in-law, Prince Andre Poniatowski, the representative of a group of wealthy French investors. Railtown Collection of Locomotives and Train Cars - The collection exhibited at Railtown 1897 State Historic Park contains 5 steam locomotives dating from 1891 to 1925. 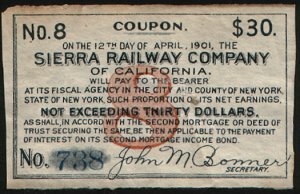 Of this total, 3 operated on the Sierra Railway and successor Sierra Railroad during its days as a completely steam-operated railroad. The collection also includes a number of train cars and a selection of internal-combustion powered locomotives, one of which dates back to an original service life on the Sierra Railroad. Below are some of the highlights of the collection you can see at Railtown 1897 State Historic Park. Angels Camp Museum - Model stamp mill and model train showing route of Angels branch of Sierra Railway. Wikipedia: Sierra Railroad - The Sierra Railroad, was founded in 1897 to connect the California Central Valley to the Gold Country foothills of the Sierra Nevada. Its historic western terminus has always been in Oakdale where a junction was once formed with both the Atchison, Topeka & Santa Fe Railway and the Southern Pacific. The Santa Fe's (now BNSF Railway] Oakdale Branch provided one freight outlet to the AT&SF mainline at Riverbank, California; the SP Oakdale Branch from Stockton was abandoned and torn out in the early 1980s. The Sierra continues to haul freight between Oakdale and Keystone, carries passengers in special themed excursion trains, and makes its tracks available for Hollywood movie productions.